Rebuild ransacked villages and discover who is zombifying the masses. "I thought this was a fun game to play. Graphics were nice and it was easy to learn." Guide Dracula on a madcap quest to find out who's zombifying the masses through their cell phones. Just as the notorious count is settling into his role as a family man, a mysterious epidemic strikes the land - people everywhere are falling under a strange spell delivered through their phones. As Dracula searches for the scoundrel behind this dastardly deed, players must rebuild ransacked villages, collect the resources they need for performing challenging tasks, and overcome awesome obstacles before time runs out. Players who make good use of the bonuses they acquire stand to unlock dozens of unique trophies. 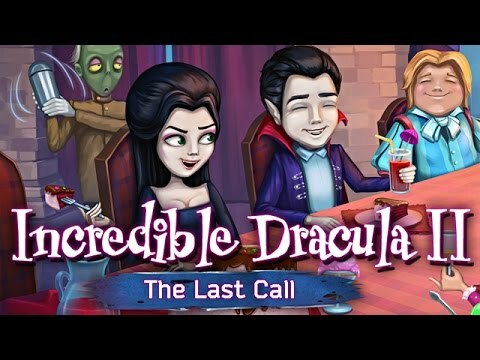 With dozens of thrilling levels, ghoulishly good visuals, and a hilarious family-friendly storyline, Incredible Dracula II: The Last Call answers the call to adventure.